most successful companies share three virtues. They have a highly distinctive core business. They make great efforts to keep their business model as simple as possible. And they apply it relentlessly to new opportunities. 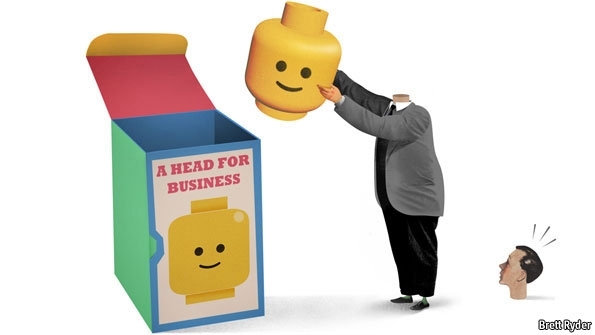 The authors use examples such as Lego that lost it’s focus on their bricks and started expanding into so-called ‘adjacencies’ like theme parks, television programs, clothes, watches and learning labs. Only after hitting a wall (and getting a new boss), Lego returned to its core business and did better. Other cited examples are IKEA, McDonalds or Berkshire Hathaway. Or Apple, with its successful succession of iProducts. [c]omplexity is no easier to avoid than cholesterol. Companies need to keep hammering away at the simplicity mantra. Well, I would say you cannot avoid complexity if you are acting in the global economy. It’s as simple as that, really. I am also a big fan of simplicity, I think that’s one reason I love my Apple products that much. Reduce to the max. Form follows function. And so on. Nevertheless, I think it is a false way to ‘avoid complexity’ by ‘simplifying’ ones activities. It is probably easier to manage a company that has one core business or one business strategy than it is to manage a company like such as Samsung or Mitsubishi with their uncountable divisions (I am always surprised when I find out what things they are producing). This is, however, not the big secret why companies like Apple or Lego are so successful. It’s because they know how to evolve in an ever-changing dynamic global economy. We may not be able to predict or direct economic evolution, but we can design our institutions and societies to be better or worse evolvers. The concept of repeatability is based on the assumption that there exists such a thing as a ‘sustainable competitive advantage’. Beinhocker is very clear in his book that such a thing does not exist and he uses many examples of successful and less successful companies to illustrate that. Apple is a good example. If Apple had just stuck to its core business – simplified and repeated – it would still build only personal computers, improved versions of the Apple II (or most probably it would build nothing at all any more). But Apple evolved together with its clients and into new fields of business. It developed new products like the mentioned iProducts and was hugely successful with it. Indeed, Apple now makes more money with other products than the traditional personal computer. At the same time, Apple remains true to its fundamental values as the mentioned ‘form follows function’ principle and the search for the most elegant, most simple solution for a given problem. ‘Simplify and repeat’ is not the silver bullet in business strategies. Successful companies evolve and adapt. Simplicity does not hurt, though. Therefore I would rather say ‘simplify and evolve’. This entry was posted in reading and tagged apple, business strategy, complexity economics, economist, eric beinhocker, mcdonalds, schumpeter, simplicity on May 11, 2012 by Marcus Jenal. Recently, I listened to a presentation by Owen Brader titled “What can development policy learn from evolution“. I want to briefly summarize here my main insights from the presentation and put some thoughts down. Experience tells us that a simplistic approach based on pre-canned policy recommendations that were gained through technical analyses and regressions simply doesn’t work. The reality is much more complex. What is called “almost impossible problems” or “wicked problems”, i.e., problems we face in complex systems, are solved through evolution, not design. For evolution to work, it requires a process of variation and selection. In the development work today there is a lot of proliferation without diversity and certainly not enough selection. Especially missing are feedback loops to establish what works and replicate it while scaling down on things that don’t work. The establishment of better and more effective feedback loops as a crucial ingredient to improve program effectiveness: “We have to be better in finding out what is working and what is not working”. In evolutionary words: we should not impose new designs, but rather we should try to make better feedback loops to spur selection and amplification. But as a direct consequence, we also need to acknowledge things that don’t work, i.e., failures, and adopt and adapt what is working. On international policy level, there are no necessary mechanisms to replicate success or kill of the failures. Staff observations can add a lot of value to M&E systems in terms of what works in the field and what doesn’t. There is a need for a culture of acknowledging and accepting failures in order to focus on successful interventions. Now, what does this mean if we have – for example – to design a new project? Firstly, I think it is important that the project has an inception period where a diversity of interventions can be tested. But we also need an effective mechanism to assess what impact these interventions have – if any. Now there is the problem of time delays – often, the impact of the interventions are delayed in time and might become apparent too late, i.e., only after the inception period. Especially when we base our M&E on hard impact data, we might not be in a position to say which intervention was successful and which wasn’t. Therefore, we need to rely on staff observation and perceptions of the target beneficiaries. Again, a very good understanding of the system is necessary in order to judge the changes that happen in the system. As already Eric Beinhocker describes in his book “The Origin of Wealth”, evolution is a very powerful force in complex systems. Beinhocker defines economy as a complex system as he writes: “We may not predict or direct economic evolution but we can design our institutions to be better or worse evolvers”. I think that the same goes for our development systems. We cannot predict or direct evolution in developing countries, but we can support the poor to become better evolvers. This has also strong implication on our view on sustainability, but I’m already sliding into the topic for another post. This entry was posted in reading, thoughts and tagged complexity, eric beinhocker, evolution, m&e, owen brader on July 27, 2011 by Marcus Jenal.